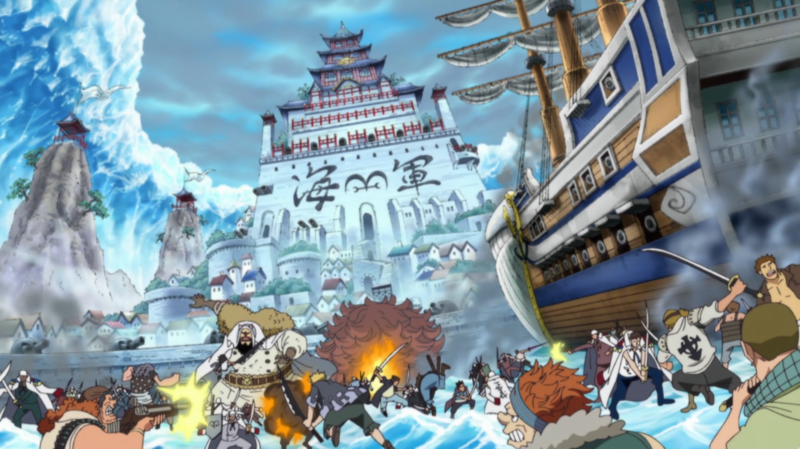 The Ten Tails has attacked the Marine Base while Luffy tries to save Ace. No the attentions turns to what could be the end for all of them. Can they defeat the unstoppable force that is the Juubi. Ten Tails appears from the coastline in its first form. All feats allowed up to there power level shown is this arc. No other characters other than what mentioned. This should be enough. . .and probably too much. Consider also that Juubi can spam Bijuudama. @westwood_trevor: Could Mihawk deflect it? 10 Tails is durable enough to tank its own Beast Bomb, so it should have no problem firing one right at the ground and obliterating everyone. Mihawk never deflected a multi-mountain (dozen) buster energy beam. Not to mention that the explosion and the shockwave could probably erase everything here, not only the ray. In other words nope, he can't. I strongly doubt that Doflamingo alone can restrain such kind of power. And if the Juubi get restrained he can easily spam an army of his mini-clones (larger than Gamakichi, Aoda, Katsuyu) or transform into his 2nd form. @westwood_trevor: OP Fans tell me that there unbreakable? Unbreakable? Nope. G4 Luffy destroyed it (strongest form of those strings) with Culverin and KK Gun. Juubi is totally on another level. Also those string can't stop the Juubi to shot down Bijuudama Ray from his mouth, or release his immense energy. Either of the admirals solo. @chris-sama: Everyone dies with the 1st TBB. How is it going to affect logias? @chris-sama: Blowing them away, before they can activate their intang. Or completely dispersing them. Nah they would definitely have time. kizaru reacted to a crystal about to explode right in between is eyes. Kuzan was able to react to whitebeard a tsunam. All are more than fast enough.also It takes time for a biju bomb to be released. @chris-sama: Those aren't the slightest bit impressive on this scale. Also, that "charge time" is really overblown. The Jubi has countered already fired TBB with his own, with no lag in charge time. Not to mention being fast enough to blitz BM Naruto and Gyuki. Still has a charge time that any of the admirals could evade. What's stopping kuzan from flash freezing it? Or akainu turning it to ash? Did you see what happened in punk hazard? Based on what? I just showed you the "charge time" is basically nonexistent. What's stopping kuzan from flash freezing it? TBB, or just pure physical strength. Or akainu turning it to ash? TBB, or that even weaker Biju fought in lava and suffered no damage. Did you see what happened in punk hazard? You mean how they fought for 10 continuous days? Yes, that's not noteworthy here. Also, this is just the 1st form Jubi. She could transform, and that would turn this into spite. Pure physical strength wouldn't stop it from freezing. Hashirama gates were able to hold down the tentacles meaning it's not that strong. Flash freeze would instantly stop it. Pure physical strength wouldn't stop it from freezing. Why wouldn't it? Doffy did that exact thing. Hashirama gates were able to hold down the tentacles meaning it's not that strong. What? That's backwards. The Jubi's strength is proven, like sending BM Naruto and Gyuki flying with a slap. Hashi holding it down is good for him, not bad for the Jubi. Flash freeze would instantly stop it. Unlikely, especially since he'll be blown away. and once frozen they all spam attack it and it gets destroyed. Or Blackbeard sinks it into darkness. Point is, he escaped, and the Jubi eclipses him. Or they all get blown away, like I said from the start. before he even unleashes the biju bomb akoiji instant flash freeze. This I agree with, 1 TBB ends it. @marc_55: they don't have to activate intangibility, it's passive... it's not in any way damaging kizaru. @god_vulcan: Except, no, it's not. @god_vulcan: That's via training, that's not an inherent ability they have. That's actually a plot point.
? I'm confused... is this a rebuttal to my statement? @god_vulcan: That should be obvious. @god_vulcan: Except, I'm not. Generally, logia are not inherently intangible. Generally, logia are not inherently intangible.